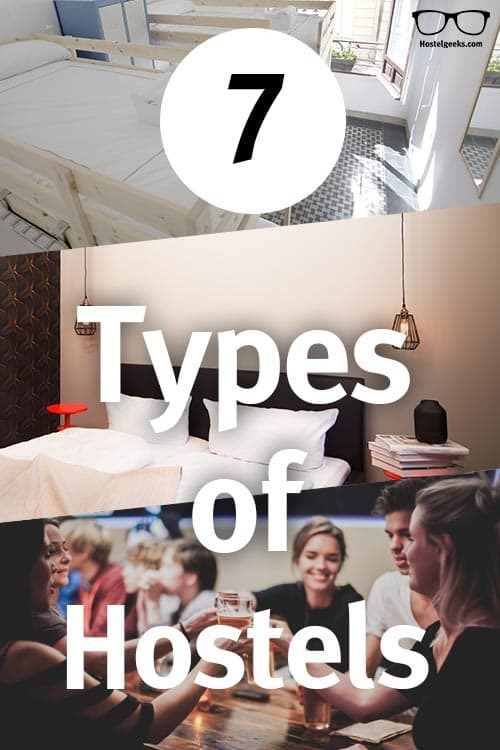 Welcome to your guide to the different types of Hostels that you should be aware of! 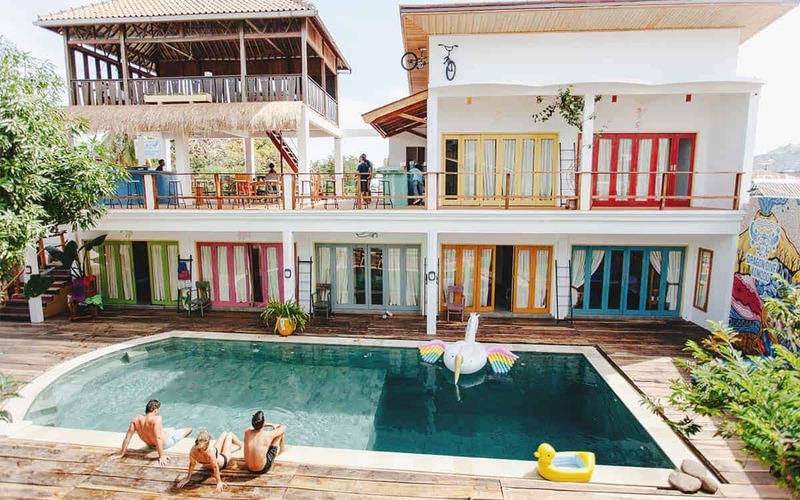 We have put together a list of the most basic types of Hostels out there to give you an overview of the variety that you can experience. If you have ever stayed in a hostel, you already know that there are also unique, or hybrid buildings out there, just waiting to be discovered. There can also easily be a combination of a boutique-styled hostel with the homely, cosy feel like that described in hostel type #2. This article is part of the Guide to Hostels where we cover many questions around its topic. The order of the listed hostel types is completely random, and has nothing to do with our personal preferences. We have also created a full guide to European Hostels. Here you will learn everything you need to know about Hostels in Europe, from finding great hostels to booking hostels the cheapest way. There are no fix standards or definitions for hostel types. We, Anna&Matt at Hostelgeeks, have a different approach here. The 5 Star Hostels unique to Hostelgeeks, are the only type of hostels based on fixed transparent criteria, where details can be found in the last point of this article. Before you can book your Hostel, you need to decide which type of Hostel fits best with your plan. Once decided, here are 15 smart tips for booking hostels. Let’s get started with the cheapest available option for a hostel. Update: Please note that there is also many many backpacker hostels. Backpacker hostels can be “Cheap hostels”, “homely hostels”, “party hostels” and “lifestyle hostels”. Yes, although Hostels are already on budget, there is still the kind we call „cheap hostels“. The cheap hostel refers to the one(s) with the lowest prices in town. Most likely the service and facilities are not to a high standard, and most likely their location is not in the city center. You can identify this easily through the most obvious hint: the price. Most of the times, the very cheap hostels do not include linen, breakfast and such. 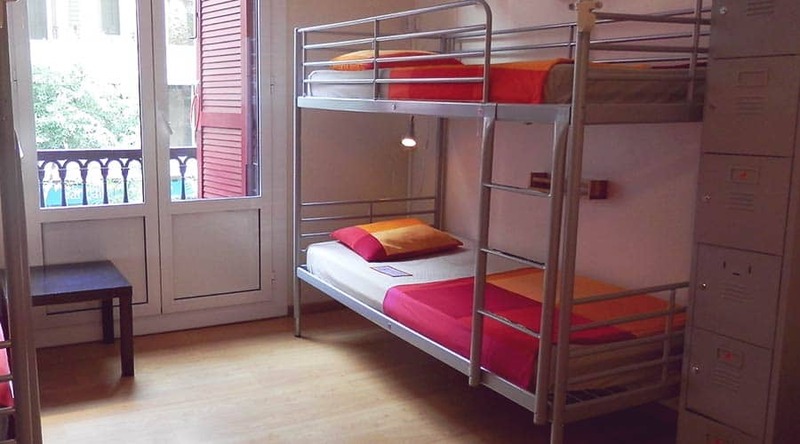 There is also a lot of hostels “pretending” to be cheap. Their trick is to exclude everything and make you pay once you arrive. They charge extra for bed linen and towels for instance. These hostels claim you cannot use your own sleeping bag, you have to rent bed linen. So truth be told, it is a mandatory fee they do not tell you beforehand. Also be sure to have a look at their reviews! The facilities, services, and ratings are generally of a lower level when comparing with the other hostels in town. Simple logic, right?! Have a look at all the hostel room types. The biggest dorm is usually the cheapest – obviously. Our recommendation: Unless you are on a super shoe-string budget, better opt-in for a different hostel type. This is the hostel that shines – on a social level! This type of hostel is maybe the most cosy one you can find. 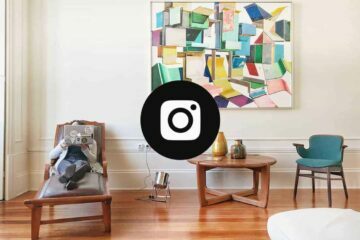 It instantly feels and looks like a home rather than a paid accommodation. There is the kitchen you can use, as well as an actual living room and many more little details which make a place feel like a home. Quite commonly, these hostels also have their own garden to relax in. It is not about the design at the homely hostel. It is more about the super lovely staff, maybe the daily family-dinner or other events. 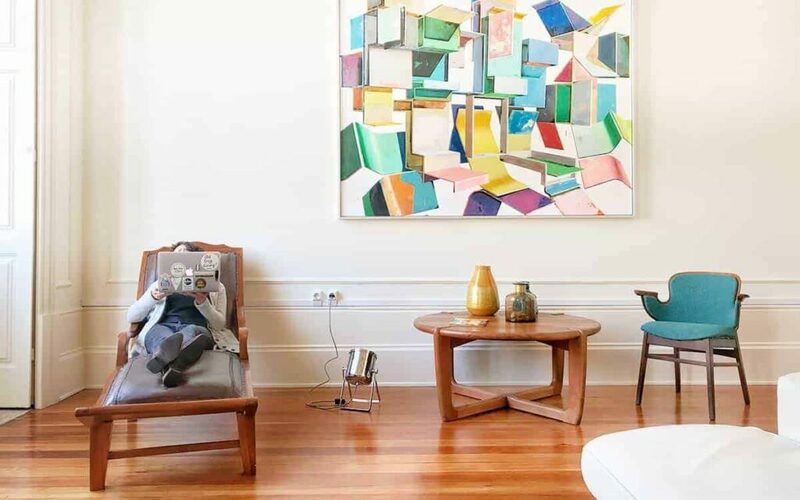 When reading reviews, you can easily find phrases like “it was so hard to leave”, “it was my home away from home” and “I kept extending my stay”. 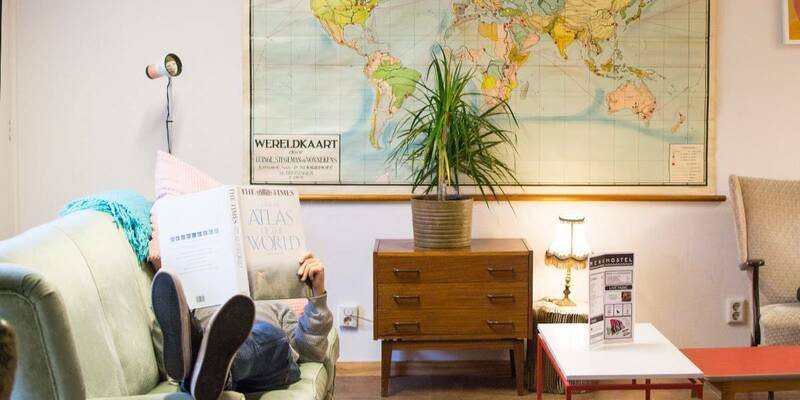 The video and photo below shows Ani&Haakien Hostel in Rotterdam – also a cosy hostel type with an artistic heart. Our recommendation: Awesome! It is about the people, so bring in your social game and join. Another interesting and outstanding homey hostel is the Hopewell Lodge in Marlborough Sounds, New Zealand. This accommodation in the north of the South Islands of New Zealand attracts the active travelers and nature lovers. You can reach the destination by water taxi, and it has been rated one of the top hostels in the country. We have visited the Hopewell Lodge and brought back an unforgettable experience. As you can see, some hostels feature two main characteristics. 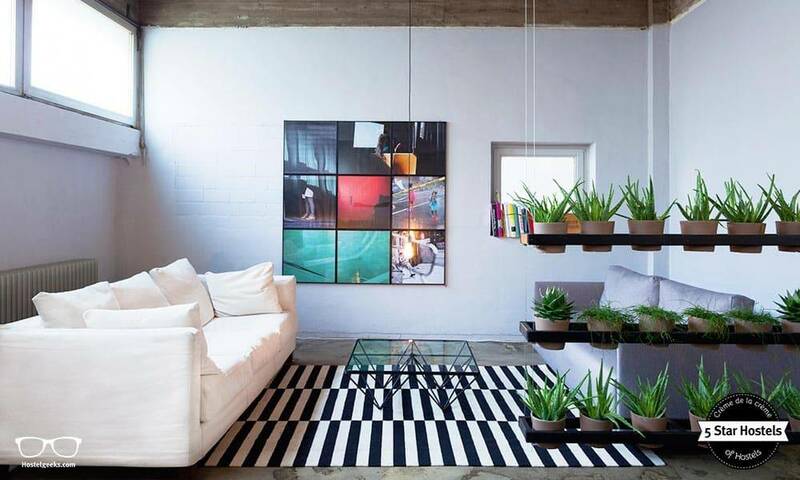 A boutique hostel is the most design-conscious type, whereby a boutique-style meets and joins with the hostel world. It is a well-designed accommodation, but still on budget. This establishment provides you with an extra comfort, and most of the time there is an interesting story to tell. We put together the ultimate list of the +110 Best Design Hostels worldwide. Let’s have a look at an example for a Boutique Hostel: The Cocomama Amsterdam Hostel, which was a first of its kind in Amsterdam. The two dutch girls, Lotje and Anika, dreamed about opening a place where the comfort and luxury of a hotel meets the social life of a hostel. This is how Cocomama Amsterdam was born. 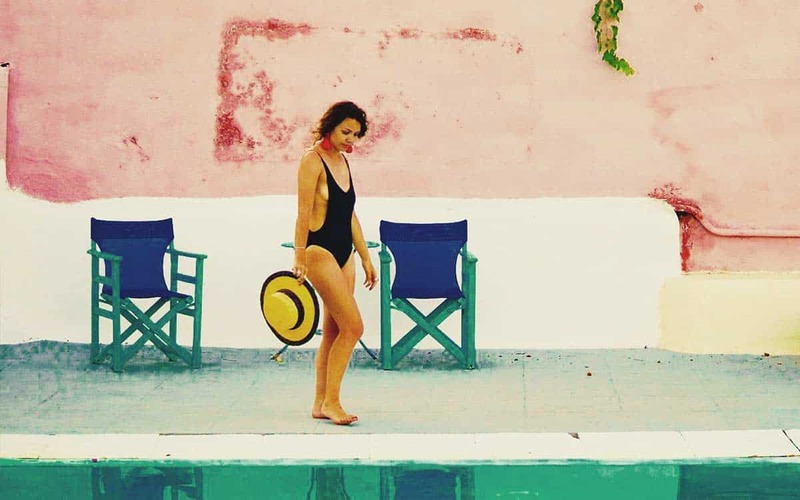 Another great Design Hostel is the brand new STAY Hostel Rhodes in Greece. It comes in a modern and fresh design, and is located only a short 5 minutes walk away from the beach. On top of that, STAY Hostel is also a 5 star awarded hostel. Another beautiful, intimate boutique hostel is Valencia Lounge Hostel. The 5 Star Hostel in Valencia features 11 neo-classical rooms, new technology, and developed a new understanding of a reception. As the name already claims, this is where the party happens! Party Hostels are oriented more towards the younger-minded travelers. 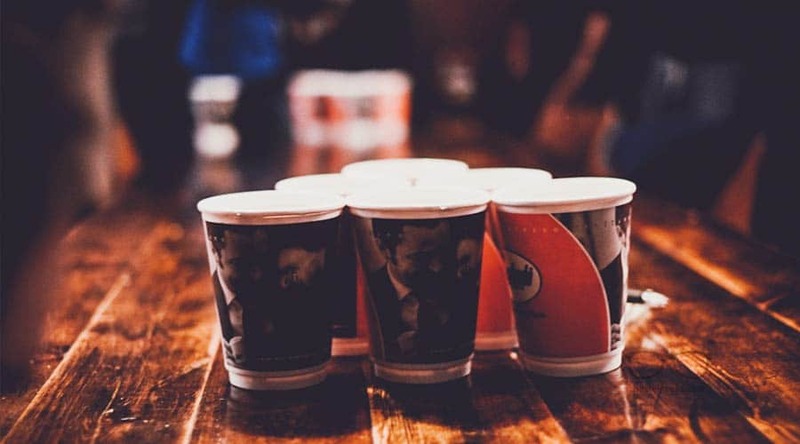 Party Hostels usually organize special events, and there is no way alcohol is missing at any point of the party! Here you might find a age restriction so just in case, make sure you are able to stay at this specific party-oriented hostel before you arrive. It is quite easy to recognize a party hostel simply by their photos on the booking platforms and descriptions on their own website. Be aware also that there are hostels out there claiming to be a party hostel at night, and a cosy hostel during day-light. The traditional youth hostel is one that has maintained its original focus over the years as a cheap, social accommodation option. Here you will stay in big dorms, find huge common areas. Without a doubt, these traditional hostels are optimized for bigger groups like school excursions and team-building weekends. 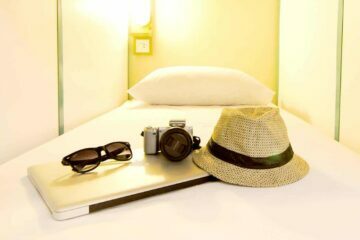 Nevertheless, you can stay here as a solo-traveler as well – a perfect option for meeting new people. This hostel type is also a great option for families. Many families with young kids love to chose a Youth Hostel. Our recommendation: Easy-going option and a warm atmosphere. Therefore, it is great. Yet it has nothing to do with backpacking. If you only want young people to hang out with and have a beer, better go for a different hostel. Although the Maverick City Lodge in Budapest is not a traditional Youth Hostel, this photo represents it quite good. This type of hostel is located next to any main activity in the area. This type can be also a backpacker hostel. These hostels are for the active traveler, and offer an accommodation themed to the specific type of activity they are providing. This is quite self-explanatory, right? It is a lifestyle which comes combined with the hostel. Let us give you some real-life examples. Dragon Dive Komodo Hostel in Labuan Bajo, Indonesia is a diving center and 5 Star Hostel. 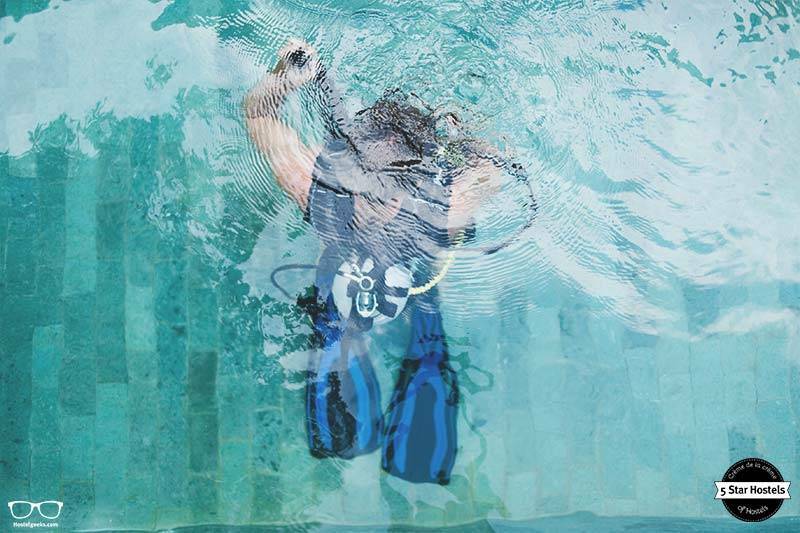 You can come here to enjoy a big swimming pool, roof top terrace, a onside bar and restaurant, even massages – and last but not least, this is where you learn diving. Here you can read our full review of Dragon Dive Komodo. 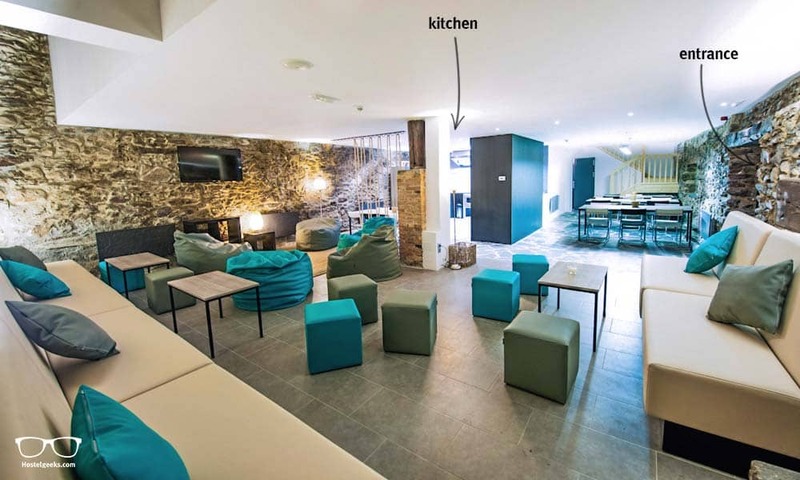 Another great example of a lifestyle hostel is Mountain Hostel, in El Tarter, Andorra. It only has 9 rooms and comes in a chic design, combining the modern with history. Andorra is known for its beautiful nature. The team itself enjoys hiking, riding, and so they can share 1st hand information with their guests. Click on the 1 min video we produced at Mountain Hostel. It gives you an insight. The 5 Star Hostels are the finest hostels in the world you can imagine. 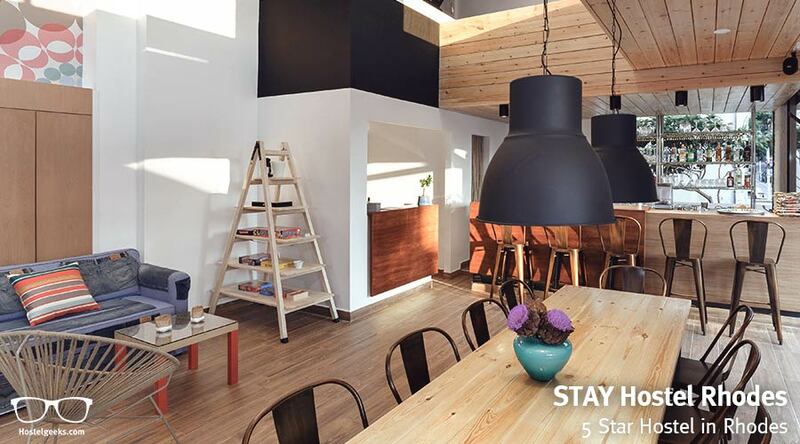 Unique to Hostelgeeks, the 5 Star Hostel is another type, combining local values, unique design, and great facilities. 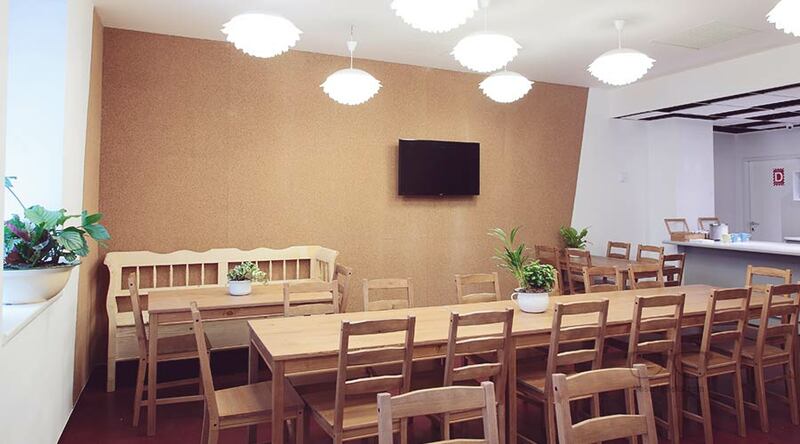 The term 5 Star Hostels refers to the transparent criteria in which they must all meet, and you can find all Hostels that match this specific criteria at the official 5 Star Hostel listing. All hostels awarded with five stars are unique and we from Hostelgeeks can proudly say that know them all like the back of our hand! Here is our full packing list for hostels. You can download the Hostel Packing List as a PDF. Simply open the .pdf and save it on your device. We also added a few more points so you can add your own items to the list. How to find always awesome hostels? 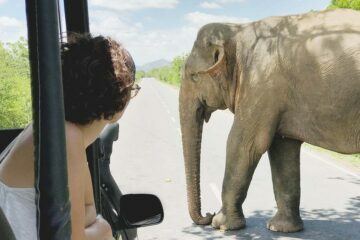 You see, it can be tricky to find the right hostel. And even after a long research, you may still need the wrong or a bad hostel. Now, we are here to help you. We unbox the hostels and check all their pros and cons. For each destination, there can be only 1 hostel be chosen to be a 5 Star-Awarded Hostel. This is your shortcut to your hostel-picks, saving you lots of time in your accommodation research. And for sure, it gives you the security of a top-hostel choice without any bad surprises. Update: We now cover as well curated 3-best hostels guides to cities with no 5 Star Hostels. As you can see there are many types of hostels out there. And the good news is you can pick the one you like most! Every hostel is of course unique and a lot of them can easily be a hybrid of two types, or maybe even more! When you are looking for a hostel, make sure you check out the reviews! This way you get an idea as it’s important to find out which type of hostel might fit in with your travel plans. Are you traveling on a strict budget, wanna try some slow travel in style, or looking for a great party? Do you want to learn more about Hostels? Check out all our articles about Hostels. We don’t hold back and give you our full knowledge, so you can make the best choices for your hostel accommodation. Every listed style has its advantage, and as said before the chosen order of these hostel types is completely random. Do you have any questions about Hostels? We would be happy to help you! Hostel Packing List – 23 Smart Things to pack + free download! Hello my name is Rudy so my question is if I book a room (hostel) would I be sharing a bed? Thanks for your comment. This is actually a common question. At a hostel you do NOT share beds. You will share your room when staying in so-called dorms. A dormitory is a room with many single beds. Travelers book single beds and share the night in the same room. You can find a detailed article on hostel room types here.